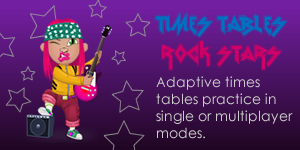 Click the image to visit ttrockstars.com. Wouldn’t it be great if everyone in the class could recall a multiplication fact up to 12 × 12 in less than 3 seconds? That’s my goal and I’ve nearly accomplished it for the third year in a row. It has taken admirable dedication and hard work on the part of my pupils and they’re now feeling rightly victorious. So how did they go about it? There are tonnes of ways to remember the times tables, just take a quick trawl through Google or YouTube. Amongst all the sound approaches, you’ll find shortcuts and tricks, like the old 9 times table finger one. These don’t do it for me at all. Full stop. They never lead to install recall of facts and they completely bypass any level of understanding of the times tables. Over the last few years I’ve been trying methods that develop the pathways in the brain that lead to understanding and recall – building a foundation of the concepts with physical objects, making interconnections within and across times tables and short, regular practice. Using multilink cubes, Numicon tiles, tokens or something similar, I show pupils how times tables are made of groups, e.g. 1 group of 4, 2 groups of 4, 3 groups of 4, etc. They get as much time with the manipulatives as possible at this stage. This is a valuable process regardless of their age. Whether they’re learning for the first time age 5 or learning all over again age 15, the physical grouping of the objects creates a foundation for the next stage, recognising the interconnections between the multiplication facts. To highlight this to the pupils I would show them how, for example, 2 groups of 4 can be doubled to give 4 groups of 4 and doubled again to give 8 groups of 4; or how 10 groups of 7 can be halved to give 5 groups of 7; or how 5 groups of 9 plus one more group gives 6 groups of 9. Number facts are very much connected and the good news is that if you know one of them you can work out most of the others if you understand how the connections work. I watched this video of Jill Mansergh at an ATM conference recently and it made so much sense to me. Jill has a wonderfully simple way of bring out the links within the (17) times table and it convinced me that I should include this approach with my pupils. Being able to navigate from one multiplication fact to another is a crucial element of mastering them. My video on using known number facts to help work out other ones. How does knowing 5 × 4 = 20 help you work out 6 × 4? I know that 10 × 7 = 70, how can I use that to find 9 × 7? If I know that 20 × 3 = 60, what else do I know? What is 16 × 16? What is 176 ÷ 16? It’s a fact that small amounts of regular practice of anything will strengthen the neural pathways. This means they will fire more quickly and reliably when you need them – all part of the install recall we’re aiming for. There are, no doubt, all sorts of nuances to these broad pseudo-scientific statements. Feel free to pick me up on them in the comments. My pupils get two doses of practice lasting about 3 minutes each, every school day for 6 months – Rolling Numbers and Times Tables Rock Stars. 1 times 3 is 3! 2 times 3 is 6! 3 times 3 is 9!…. No? OK, maybe you know someone who does. Let’s call this the Traditional Chant. Yeah! 3, 6, 9, 12, 15, 18, 21, 24, 27, 30 aaaaaaannnd 33, 36! Uh huh! This team’s got in goin’ on, goin’ on, oh yeah! No? OK, never mind. Let’s call this Rolling Numbers anyhow. There are three reasons why I’ve found Rolling Numbers to be more effective than the Traditional Chant. The body percussion, lyrics and call-and-response style of Rolling Numbers is a lot more enjoyable and entertaining than the dry, formulaic Traditional Chant. Anything that is more enjoyable has more ‘repeat capital’ with the pupils – you can practice it more often before tedium sets in. There are ways to up the entertainment value further, such as by doing it at double speed, trying it in French, doing it backwards, or competing for volume. The economy of language in Rolling Numbers holds several advantages over the Traditional Chant. Fewer words, as well as making it easier and shorter (great for its repeat capital), brings the numbers in the sequence close together, which allows them to be associated with one another in the brain. This is very important as numbers start sounding right together. 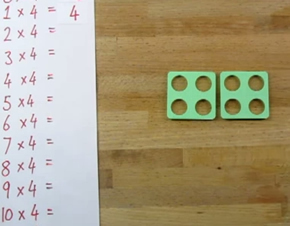 To test this you, as the teacher, can roll the numbers in front of the pupils and deliberately slip in an incorrect number. They become so familiar with the rise and fall of the sounds of the numbers that the wrong number sticks out like a sore thumb. In the Traditional Chant, the numbers in the sequence are separated by all the 1-times-x-is-, 2-times-x-is-, 3-times-x-is-, etc. Not only does make it harder for the numbers to sound right together but the working memory is also overloaded by all this verbal padding and it will take considerably more repetitions for the same gains. While you’re calling out the numbers, you and the pupils should be counting off on your fingers as you go. The combination of the physical movement of your fingers with saying the numbers aloud at the same time, creates a durable association in your brain between where you are in the sequence – finger number 7, let’s say – and the number fact – 21, 28, etc. This association is so durable, in fact, that over time pupils can go straight to the finger and come back with the answer. Give pupils a rock name (Iggy Winter, Baz Hendrix, etc. ), give them 60 questions and a 3 minute time-limit, play some rock music while they’re doing it, reward them with titles like Rock Star and Rock Legend for reaching a particular speed threshold, splash posters of them around the school, display their names in a Top 40 style chart, award them a Platinum disc after correctly answering 2000 questions, join in, play air guitar, give the Rock Gods red carpet treatment, juice the metaphor of rock stardom for everything it’s got! Times table recall speed will skyrocket. Watch the video or read this earlier post to find out more. There are many ways to go about teaching and learning the times tables and I would venture that none of them alone will lead to true mastery. I’ve found it takes three distinct stages to get there: direct teaching of the basics, learning to associate parts of the times table and old fashioned practice (with a modern twist). The combination of these three strategies has worked for my students but I don’t claim to have done any empirical testing on the Best Methods Of All Time! I recognise that you’ve probably been having more success than me for longer so I’m all ears if you want to share in the comments what works for you. It’s awesome to see the students having so much fun. You’ve turned what is often a boring and mundane activity into something fun and challenging. Inspiring! Thank you 🙂 I used the Jill Mansergh numberstick method today and it was fantastic. 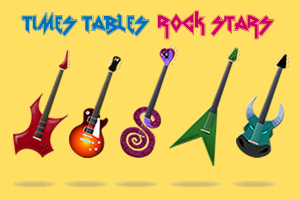 We do speed tables at our school and do a speed tables olympics, but might just think about rockstars for next year. I think something is missing here. My own recall of times tables is more like a ‘look-up table’. So if you ask me 7 x 8 I know it’s 56 just like that. My primary age children all have to work it out and even though they can do this quickly, it’s not hard-wired. I could also tell you immediately if a number, say 76, is in any of the 1 to 12 times tables (it’s not). In fact not many numbers are. If you need to find an answer quickly, narrowing down the possibilities should help. Perhaps I was taught this way back in the 1970s? Does anyone take this approach nowadays and do you think it could be useful? These all sound like great ideas. Many of my kids are confident with much of this, claiming that they know a table “in order” but struggle with a multiplication out of context. (Often just a confidence thing.) I’ve found that flash cards are great for this: if you have cards with “1 x 6”, “2 x 6”, etc written on you can work your way up and down the times table and then shuffle them. You can do all kinds of variations with a pack of playing cards, and “pick a pair” (every time you turn over two cards you must multiply the numbers together, so square numbers stand out as winning pairs) is very popular with my students. Had a really good expanding(?) rhythm which could be speeded up & slowed down & you could still add the rhyming bits in between. I like it because it anchors the answer to the number it’s multiplied by which helps with division and instant recall. Even if the traditional chant is “dry and formulaic” so what? It’s still important to learn it. There are lots of opportunities in the average school day to fit in practising the chant : marching along (off to PE for example) while chanting, ask the break time supervisors to chant with the children while waiting for the teachers to come and collect their class then the teacher can continue the chant on the way in. Chant in assembly while waiting for other classes to file in. The traditional chant is important, the rolling numbers method doesn’t give instant access to something like 7*6, whereas the chant does. It’s also best for access to the answer when dividing. Just knowing that 42 belongs in the rolling numbers list of the sixes can’t tell you how to divide 42 by 6, whereas knowing 7 * 6 = 42 will give you an immediate route to calculating 42/6. I also think there’s a case for drumming in the 7s, 8s and 9s even more than the others as these are the ones which seem to drop out of the memory over time.